This is exactly what happens on some nights! Last night I did something I shouldn’t have done. I slept like usual. On my back, with four hot bags placed stratigically on the bed and a pillow under my knees..
….and then in the middle of the night… I turned onto my left shoulder and pretty much slept on it till morning… I think I woke up because I heard a tiny “pop” . Yep. Very common! It was BAD. Super BAD. 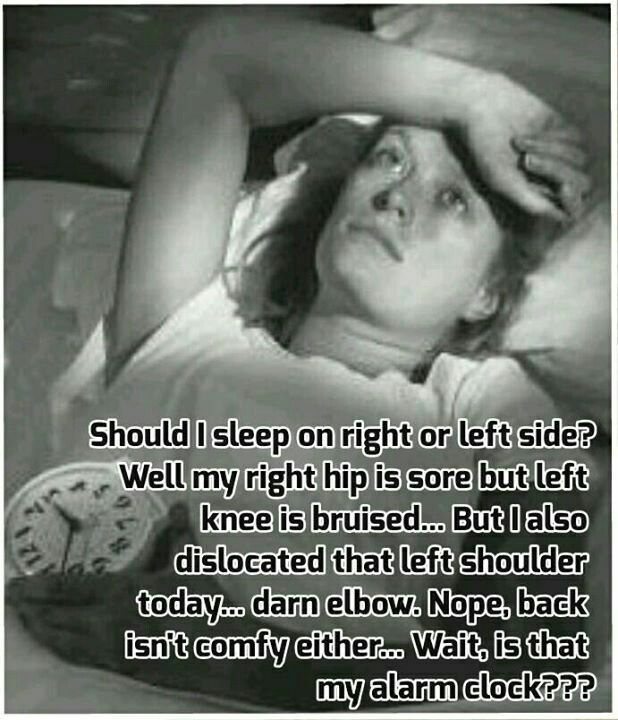 Getting up feeling like your left side is on fire is a BAD sign. I had pain running down right from the back of my left ear, down my neck, into my shoulder joint, down my elbow, into my wrist and my palm, all the way till the tip of my left ring finger. My muscle were so tight! My Physiotherapist describes my muscles as “crunchy” and it’s extremely disgusting to hear the crunchiness as she works on them. Today’s session helped loosen it all up a little bit and I managed to get through the day…. but right now as I type, I can feel my left side stiffening up… so I’m going to stop now.